The middle and upper classes in the 19th century could afford to buy their furniture new from retail outlets and department stores in cities. The working classes, however, could rarely afford new furniture and often bought theirs second hand from market stalls and junk shops. 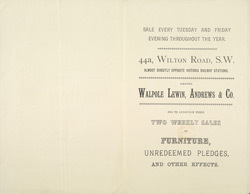 Sales like the one advertised on this leaflet at Walpole, Lewin, Andrews and Co, would have been very popular.